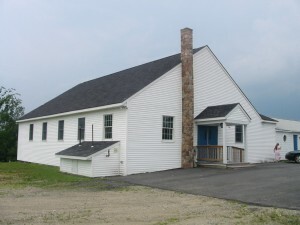 Important: The Brunswick meetinghouse has been sold and all services are now being held at the Wales meetinghouse. Directions: Take the Maine Turnpike to Exit 86. Make a left off of the ramp and drive 8/10 of a mile, then turn right onto Pleasant Hill Road. Take a right at the next intersection and follow Route 126 East for six miles. Meetinghouse will be on the right. Prayer Meeting: Wednesdays at 7:00 pm.